Here is a glimpse into a few things of many that you can do on your visit to Tonopah, Nevada. Today we’re going to stop by the Clown Motel, where this local business earned its name because of the beautiful collection of antique and modern clowns. The Clown Motel is located at 521 N Main Street. According to roadtrippers.com, the Clown Motel is America’s scariest motel and makes claims that the motel is haunted by hundreds of ghosts. In Tonopah I met with Bob Parchetti, fifth generation Tonopah native and owner of the Clown Motel. Bob explained that the motel sits next to the town’s first graveyard, which opened its gates in 1901. Fourteen miners who died in an underground fire at the Belmont Mine in 1911 were laid to rest at this burial site. Among the many other people buried here are numerous victims of a mysterious disease dubbed the “Tonopah Plague” when it first appeared in 1902. 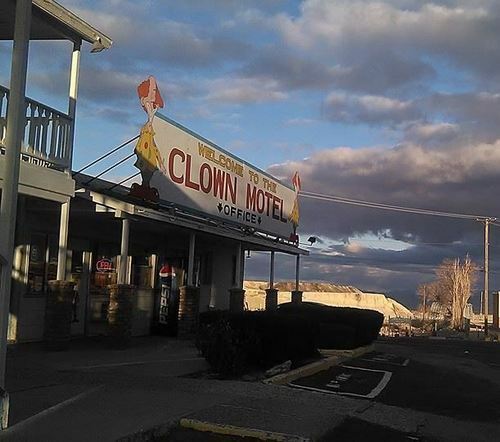 The Clown Motel offers 30 rooms, each room equipped with two spacious queen beds, 19′ color television, Dish Network Satellite, wireless internet, and fresh coffee in the office made daily. Each room has a refrigerator and microwave. A soda and water machine along with free ice are located on the premises, with a candy and snack machine in the office. The warm and friendly staff at the Clown Motel take great pride in serving you. Next, we take a glance of the Tonopah Speedway a 1/4 mile oval dirt track located just a few miles outside Tonopah on Highway 6 headed towards Ely, NV. The track opened its doors to racing in 1983. Currently running on the track are IMCA Modifieds, Hobby Stocks and Mini Stocks being the main classes. The Central Nevada Racing Association is in charge of running the Tonopah Speedway. You can view their website here. Lee Ketten, the president of the Central Nevada Racing Association, explains that Jim Marsh is a great contributor to the track, helping fund insurance through advertisement from all his many businesses that contribute to the Tonopah Speedway. “Without his generosity we wouldn’t be able to continue to race at the Tonopah Speedway”. The racing starts at 7 pm mostly, except special events or two day races. The schedule of races at the Tonopah Speedway is posted on the website listed above. Tonopah Speedway serves hamburgers, hot dogs, nachos, candy, soda, water, and beer. Stop by Kiddy Corner’s Booth, where you can find toys, t-shirts, hats, and of course candy! Enjoy the roar of the engines and an exciting night out at the races here in Tonopah, Nevada. Followed by some good eats and refreshing beverages of your choice. Last but not least, the Jim Butler Days celebration starts May 23rd and runs through May 30th. This year marks the 46th year of the celebration. 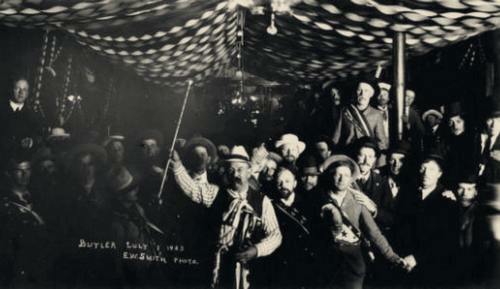 Events included during Jim Butler Days are a street dance, a parade, ceremonies, the State Mining Championships, arm wrestling, gold panning, and tours of Tonopah’s Historic Mining Park. And there’s a comedy show on Sunday May 29th: Adam Hunter’s Comedy Show. This is just a glimpse of some of the things and places you can visit here in Tonopah, Nevada. So take a stop by the Clown Motel, check out the races at the Tonopah Speedway, or come celebrate with the Tonopians during the Jim Butler Days Celebration. Enjoy food, drink, fun, dancing, the State Mining Championships, Adam Hunter’s Comedy Show on Sunday May 29th, and much more during this annual celebration. Come explore the old western town of Tonopah, Nevada, and see for yourself why many people chose to call Tonopah their home in the past, now and into the future!